They were traveling in a hand-drawn wagon when Marie-Louise gave birth to José (the future Charlie) in Cubelles, a village near Barcelona. Surviving as best they could, they finally reached France three months later. They soon secured an engagement with the small Cirque Dusoulier. This was the first circus ring little José stepped into. At age two, he appeared in his father's risley act. 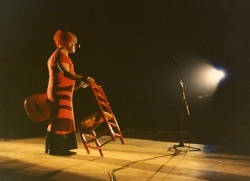 The following year, the family was with Cirque Caignac, where José performed both a solo parody of a strong-man act and a hand-to-handAn acrobatic act in which one or more acrobats do hand-balancing in the hands of an under-stander. 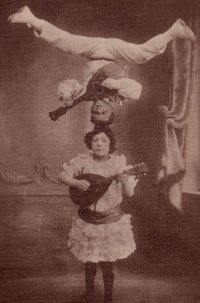 balancing act with his young sister, Neña (Maria Luisa Andreu, 1897-1915), in which he originally dressed as a girl—which made their "all-girl" act look more attractive to agents and directors. The Andreu family went on to other small circuses, where José appeared in a balancing trio called Los Pepitos with his sister Neña and his brother Polo (Paul, 1899-1977). It was probably in 1905, at the circuses Zanfretta and Lambert, that the three siblings began work on their standing-frame flying-trapeze act, with Neña as the catcherIn an acrobatic or a flying act, the person whose role is to catch acrobats that have been propelled in the air.. The following year, in 1906, José got a first taste of clowning, when the director, Monsieur Lambert, called on Jose to replace the house clownGeneric term for all clowns and augustes. '''Specific:''' In Europe, the elegant, whiteface character who plays the role of the straight man to the Auguste in a clown team., Carleto. Meanwhile, three other Andreu brothers were born: René (Renato, 1903-1976), Marcel (Celito, 1906-1970), and Roger (Rogelio, 1909-1991), who would soon become part of the family acts. In the late 1910s, circus and variety shows were invaded by parodies of Charlie Chaplin, whose extremely popular movie character, the Tramp, had become a customary comic addition to specialty acts in need of a comedy boost. José, who already used comedy in his trapeze act, introduced his Charlie character in 1916. To distinguish their trapeze act from the Andreus' risley act on the bills, the family titled it Charlie and the Rivels (Charlot et les Rivels). As legend has it, they simply made up the name Rivel by picking letters at random. From then on, José Andreu would be known as Charlie Rivel. In 1930, the trio embarked on a one-year South American tour before returning to the vast German circus and variety circuit. But the working atmosphere between the siblings had deteriorated. Charlie, the most identifiable of the brothers, was the star, and he knew it. In 1935, at the Circus-Varieté Schumann of Frankfurt, Charlie decided to part ways with his father and brothers and to build a career with his sons and his wife. After Charlie Rivel's departure, his brothers continued to perform the same acts in German variety theaters, with no less success than they had enjoyed before. Celito replaced Charlie in the flying-trapeze act and the clown entrée(French) Clown piece with a dramatic structure, generally in the form of a short story or scene., and the younger Rogelio joined the act too in 1937. Then, in 1941, it was Polo's turn to leave the family acts. He worked for a time with the well-known French clown Alex Bugny, then with Andreff and Louis Comotti at Circus Knie in 1943, before teaming up again with Alex Bugny and finally embarking on a solo-clown career with the help of his sons. As this suggests, Charlie Rivel was not easy to work with. He changed partners often during these years. Among them were Paul and Alfredino, the Duo Reos, and the clowns Pauli and Johnny. Charlie and his wife, Carmen, had four children: Paulina, born in Barcelona in 1921; Juanito (Jorge-Juan), born on a ship sailing between Valencia and Palma in 1923; Charlie, Jr., born in London in 1925; and Valentino, born in Brussels in 1927. Charlie's children performed in a third family act, The Charlie Rivel's Babies. Charlie gradually shifted from the clownGeneric term for all clowns and augustes. '''Specific:''' In Europe, the elegant, whiteface character who plays the role of the straight man to the Auguste in a clown team.-trio format to solo work. Abandoning forever his flying-trapeze act, he began developing two pieces that would become clowning classics: his musical entrée(French) Clown piece with a dramatic structure, generally in the form of a short story or scene. with chair and guitar, and his parody of an opera diva. He was assisted in the ring by his son Juanito and later, after Cirkus Schumann had ceased to exist, by his daughter, Paulina. The two sketches remain masterpieces of clowning, among the few that are impossible to replicate. Charlie published his autobiography in Denmark in 1971, titled Stakkels Klovn (Poor Clown). The manuscript was immediately translated into several languages. 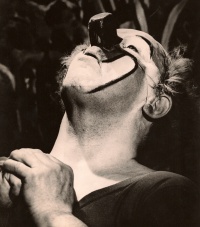 In 1972, he appeared as himself in a sequence for Federico Fellini's film I Clowns. In December 1974, he was the very first recipient of the Gold Clown award at the 1st International Circus Festival of Monte Carlo. He was seventy-eight years old. In 1981, Charlie Rivel received the cross of the Norfsjarneorden, the highest distinction in Sweden, which was presented to him by the Swedish Minister of Labor. But Charlie's later years were plagued with respiratory ailments, and on July 26, 1983, he passed away at the hospital of St. Pere de Ribes. The following morning, photographs of the great clown were prominently displayed, surrounded by flowers, in the shop windows of Stockholm.